Spencer Tracy in San Francisco with Jeanette MacDonald. Spencer Tracy is the star of the evening on Turner Classic Movies. My two major recommendations are W. S. Van Dyke's San Francisco (1936), corny to the bone but enjoyable all the same, and Up the River (1930), one of Tracy's earliest efforts, directed by John Ford and also featuring a young Humphrey Bogart. 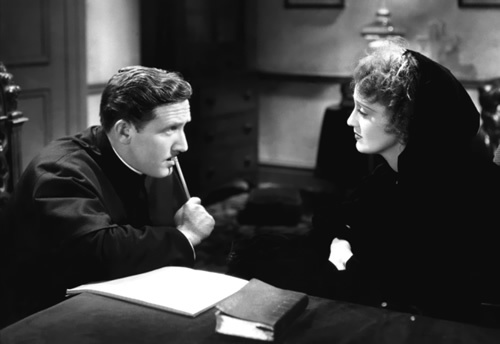 Tracy, as a tough-talking priest, earned an undeserved Academy Award nomination in the Best Actor category for San Francisco – the best performance in that movie belongs to the earthquake, though Jeanette MacDonald's kitschy saloon singer is fun to watch. Now, Tracy's Oscar nod 22 years later for The Old Man and the Sea (1958) was more deserving if you ignore the fact that the actor is supposed to be playing a Cuban fisherman. But then again, at least his Cuban fish-catcher doesn't mug nearly as much as his Portuguese one in Captains Courageous. The Devil at Four O'Clock (1961) features a volcano eruption that feels as phony as the film's dialogue and characters. But it's kinda curious that Devil comes to life only when death is about to engulf most everyone on screen. Mervyn LeRoy, the guy who brought you all those cool Warner Bros. movies of the early 1930s, directed this papier-mâché dud. Clarence Brown's Plymouth Adventure (1952) offers the fairy-tale version of the Pilgrim's voyage to North America. In addition to Tracy, the cast includes Gene Tierney, Van Johnson, and Dawn Addams. Epic dramatization of the Pilgrims' journey to the new world on the Mayflower.